Carnival is the season of merriment leading up to Mardi Gras, which is the Tuesday before Ash Wednesday and the beginning of Lent. 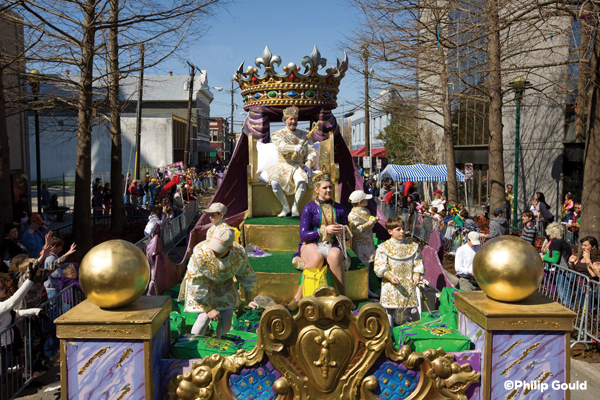 During Carnival, south Louisiana celebrates with parades and other special events. Krewes are the organizations that sponsor the parades, which are sometimes preceded by krewe pageants and balls. The krewes pay for all the expenses of their balls and parades, including the throws krewe members fling to waiting parade-goers lining Lafayette streets. 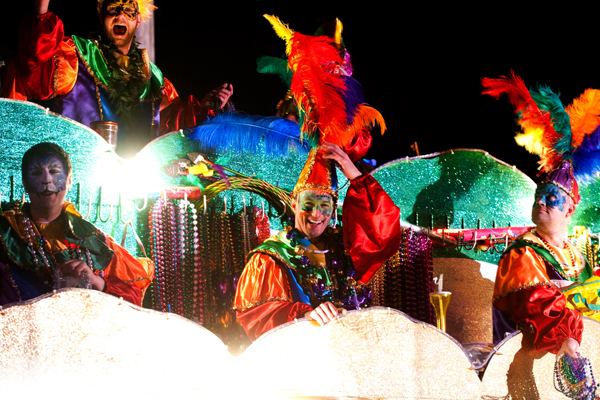 The tradition of throwing doubloons, beads and trinkets started in New Orleans in the early 1870s when the city&apos;s Twelfth Night Revelers flung trinkets to the crowds while they made their way through New Orleans streets. The idea was so popular with their audience that the tradition continues to this day, although modern throws involve mostly beads. 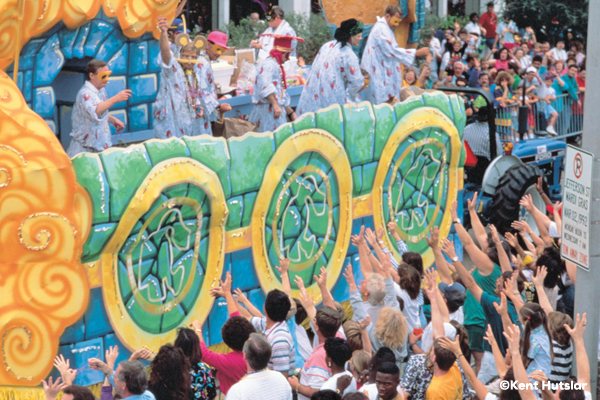 The New Orleans Rex parade began throwing doubloons in 1960, a modern take on the ancient pirate coin. These silver, gold and bronze-colored aluminum and cloisonné coins are not as popular as they used to be, but they are still coveted as collector items. In addition, special throws with the krewes emblem can become valuable over time. The Krewe of Carnivale en Rio in Lafayette, for instance, offers theme-based beads, cups and T-shirts that differ every year. Parades in Lafayette begin with the Krewe of Rio, then follow with three on the weekend before Mardi Gras. 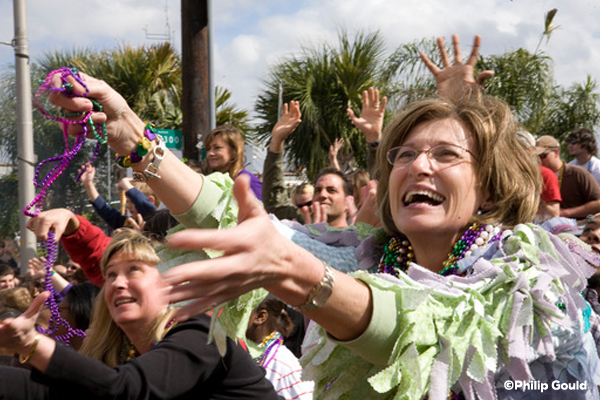 Monday evening is Queen Evangeline&apos;s Parade but many of the women&apos;s krewes in town will be riding on the parade floats as well. On Mardi Gras day, there are three parades in Lafayette the long-standing King Gabriel&apos;s Parade at 10 a.m., the Lafayette Mardi Gras Festival Parade at 1 p.m. and the Townsquare Media Independent Parade at 2:30 p.m.
Carnival parades in Lafayette cater to families, which is why barricades are set up along the entire parade route from downtown Lafayette to Cajun Field. Lafayette Travel offers a handy parade map so a good plan of action is to scout a home base, preferably near places where children can rest if they need to and use facilities such as Port-A-Potties or bathrooms at amiable businesses. Cajun Field, where the parades conclude, has a massive parking lot and space for children to run around. There&apos;s also Le Festival de Mardi Gras a Lafayette, a carnival with rides and live music that occurs at Cajun Field. Crowds gather along the parade route so be sure to keep a good eye on your children. Police recommend writing the child&apos;s last name and parents cell phone number on their clothing or putting the information on a card that&apos;s then attached to their clothing with a safety pin. Tell your child to find a policeman who will be present along the parade route if they get lost. Winter in Louisiana changes constantly; it may be in the 70s one day (what we call parade weather) and drop below freezing as a cold front passes through. Be prepared and dress for cold and warm temperatures, using clothing layers that can be added or removed depending on the weather and keep hats and gloves handy. Blankets are good for picnics and for children to sit on, but can also be used for warmth should the weather turn cold. Its also a good idea to bring along an umbrella. For a complete list of Carnival parades see below or visit LafayetteTravel.com/MardiGras for more info on balls and other activities in Lafayette and surrounding cities.